Ideas, answers, and community for candle and soap makers, and anything else that strikes our fancy. So you want to make a container candle?! Welcome to candle making! Whether you are making candles for yourself or intending to sell them to others, candle making is a fun hobby and a creative outlet. By making candles at home, you decrease the cost of the candles you love, have endless options of fragrance and color, and you can make personalized gifts for friends and family. Check out our candle making kits for almost everything you need! We recommend purchasing a digital candy thermometer. Protect your work surface with newspaper or something similar. Use the glue gun to place a small amount of glue on the bottom of the wick(s) and glue it to the center of each glass container. 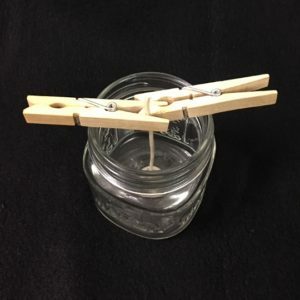 You can use a dowel or pencil to center the wick while the glue is hot. An 8 oz jelly jar holds approximately 5.4 oz by weight of wax each. Melt approximately 5.4 oz wax in a double boiler by placing the wax inside the included pouring pot and then placing it into a larger pot that has 1-2 inches of water in it. 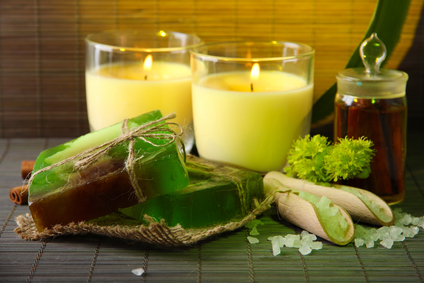 Heat the wax to 185 degrees F. NOTE: Be careful to prevent any water from getting into your wax! Once your wax has reached 180-185 degrees F, remove from heat and add candle dye if desired, stirring thoroughly but gently until melted. It may be necessary to slightly increase the temperature back to 180-185 degrees F to completely melt the dye. We recommend chipping off small pieces of block dye and adding them slowly until you achieve the desired shade. Some people use the tip of a knife to break off a small chunk of dye, or you may also use a vegetable peeler to “shave” off a pinch of dye. Once the wax cools to 130-140 degrees Fahrenheit, pour the wax slowly into the glass container. Stop pouring when the wax level meets the base of the neck of the jar. Allow the candle to cool for at least 12-24 hours. Trim the wick to 1/4 inch and make sure you trim the wick each time you light your candle for cleanest burn and best burn time. 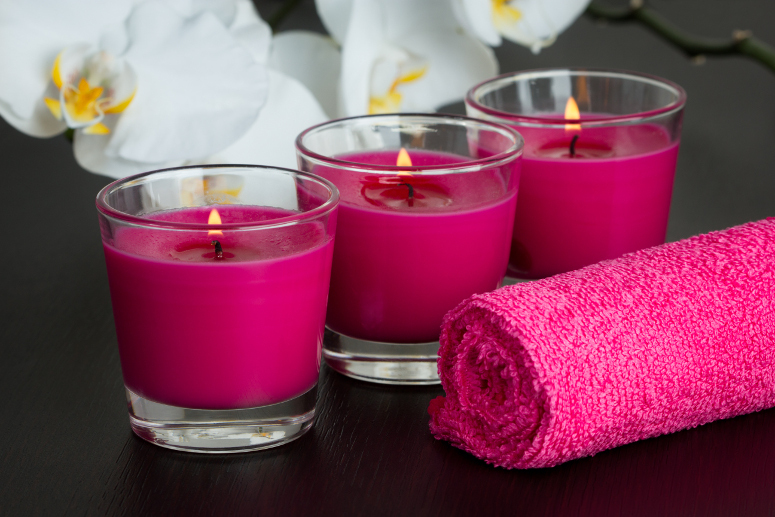 Many candles are most fragrant after they have cured at least 48 hours. Cure-time may vary. It may be necessary to slightly heat the top of the candle to smooth out the surface. You can do this with a hot hair dryer or a heat gun, but be sure to move your heat source continuously to avoid melting the wax coating on the wick. Be sure to place a warning label on the bottom of the container. NOTE: Never dispose of your wax down the sink or toilet. All waxes, including soy wax will clog your pipes. To clean your tools, heat any wax with a hot hair dryer and wipe clean. Once you have removed all wax, you can clean as your normally would with soap and water. It is recommended that items used to prepare candles be dedicated to candle-making and NOT be used in food preparation. Previous PostPrevious Welcome to Crafter’s Community! Welcome to the blog of Community Candle Supply where being part of our community means getting fast, friendly service. We will post on topics pertaining to the fragrance industry, candle making, soap making, and any other thing that seems interesting.